WHAT IF WE FOUND A CURE FOR DEATH? Two of comics most acclaimed creators, SCOTT SNYDER (WYTCHES, Batman, American Vampire) and JEFF LEMIRE (DESCENDER, Moon Knight, Sweet Tooth) unite to create a three-part epic like no other, set in a future where a genetic cure for death has been found. Years after the discovery, one man starts to question everything, leading him on a mind-bending journey that will bring him face-to-face with his past and his own mortality. 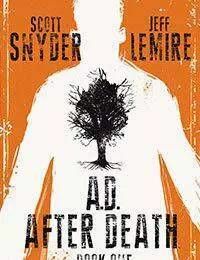 A unique combination of comics, prose, and illustration, A.D.: AFTER DEATH will be serialized monthly as three oversized prestige format books written by SNYDER and fully painted by LEMIRE.